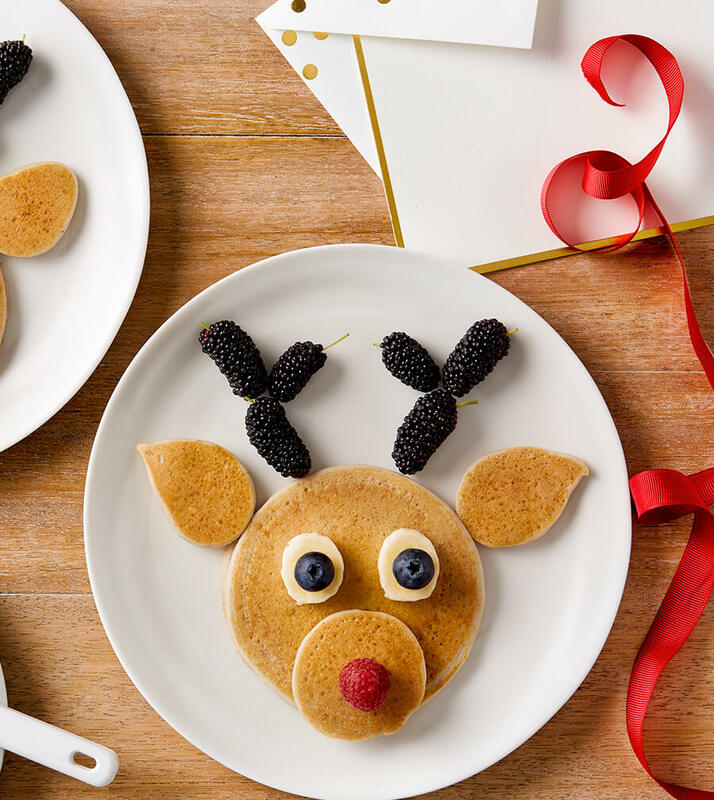 Surprise the kids on Christmas morning with these fun, festive pancakes! Pour the almond milk into a blender with the vanilla extract, almonds, buckwheat flour, rice flour and baking powder. Add the banana, then blend until smooth. Heat a little olive oil in a large non-stick frying pan on a medium heat. You want to make 4 large pancakes and 4 smaller pancakes. Use about 4 tablespoons of batter for the large pancakes and 3 tablespoons of batter for the smaller pancakes. Cook until golden on each side. Use the remaining batter to make 8 small teardrop-shaped pancakes (for Rudolph’s ears). To arrange Rudolph, divide the large pancakes between 4 plates. Place a smaller pancake on top. Position ears on each. Use a raspberry to make Rudolph’s nose. Use 2 slices of banana and 2 blueberries to make Rudolph’s eyes. Use the mulberries to make his antlers. Serve with any remaining berries and a drizzle of maple syrup.